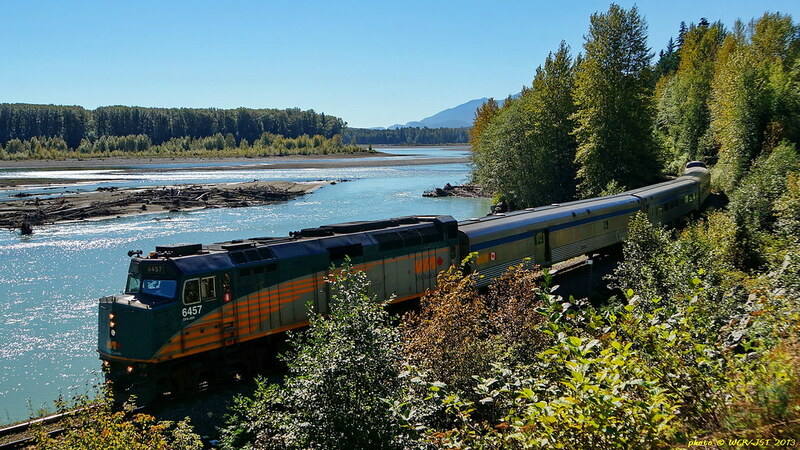 Via Rail Canada's east bound Skeena on CN's Bulkley Subdivision (BC North mainline), just west of Smithers, BC - 2 October 2013. That is Kathlyn Lake in the foreground. Beautiful fall colours today in the Bulkley & Skeena valleys. Taken while on my long trip home via Prince George. 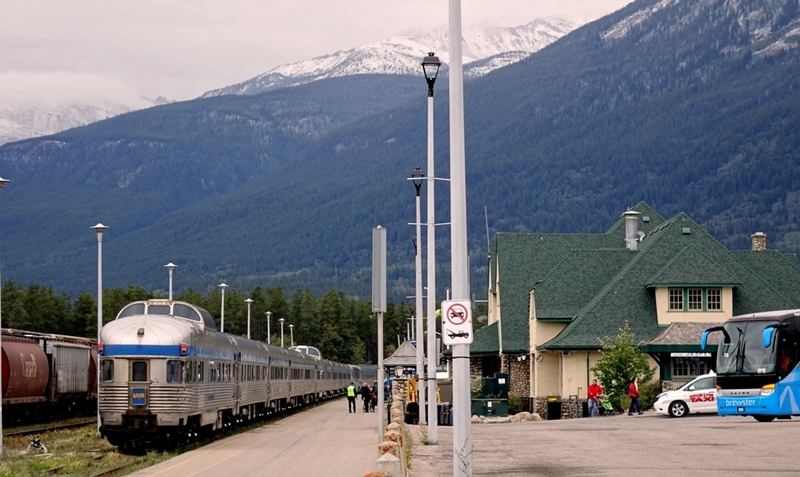 A new thread for anything to do with VIA, our subsidized passenger rail service in Canada. 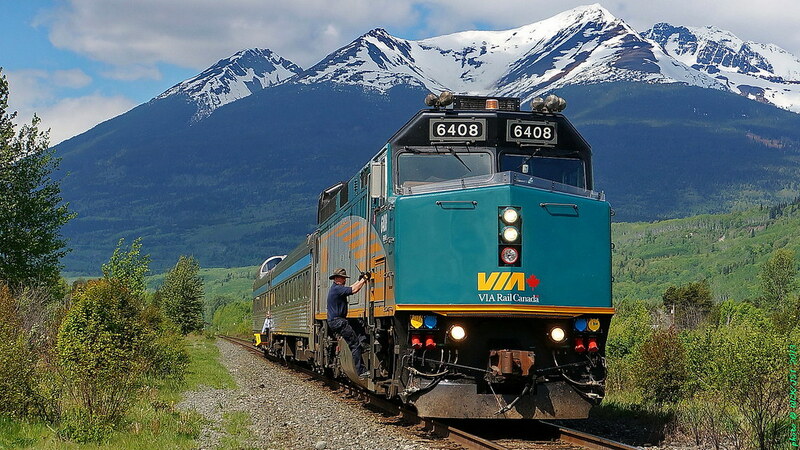 Via's The Skeena being serviced at the Via Station in Jasper, Alberta - 19 July 2013. 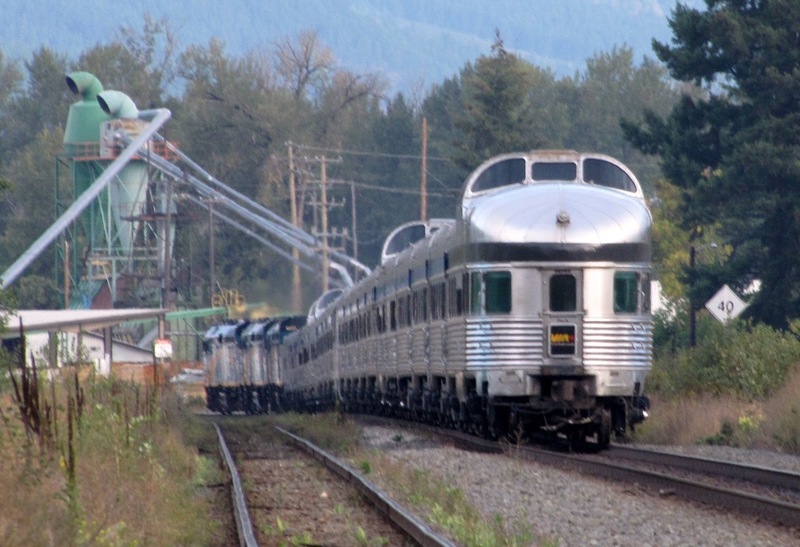 This is the Skeena in her summer outfit - swelled to two locomotives & 5 cars including 2 domes. 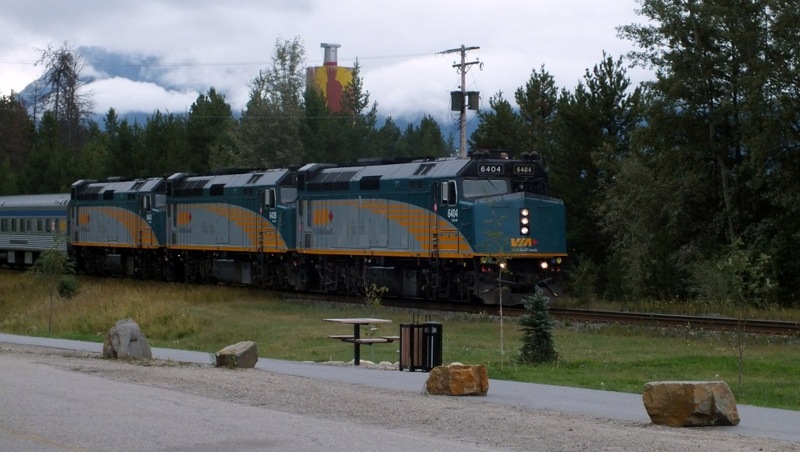 The Skeena connects Jasper with Prince Rupert (3 times per week) via Prince George (the town) where an overnight stop is made. 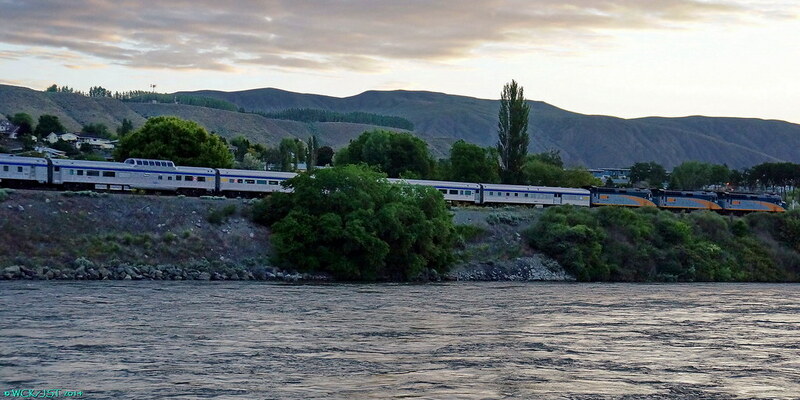 VIA Canadian transcontinental train, seen by me at 8:00am on September 9, 2013. - I'm at Louis Creek, south of Barriere. 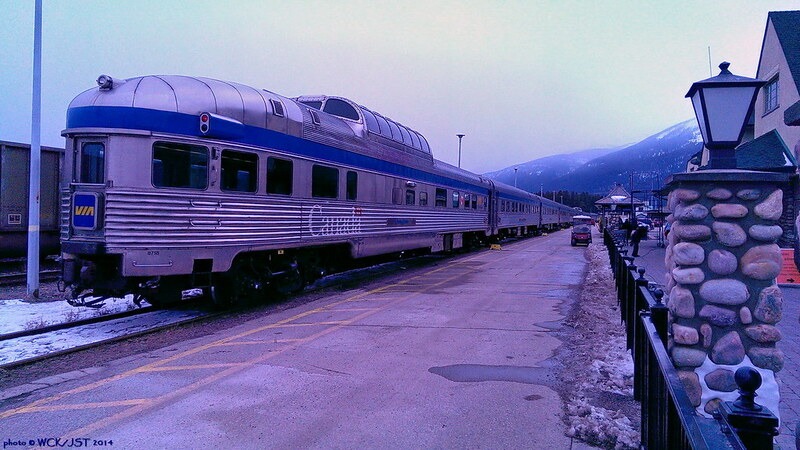 The train is 1 hour after leaving Kamloops. 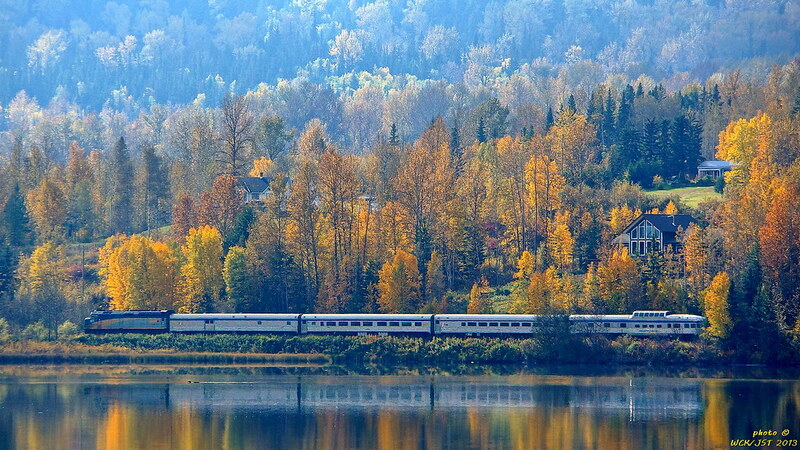 The Skeena east bound @ mile 4, CN's Skeena Subdivision, just west of Terrace on the BC North mainline - 3 November 2013. Running about 10 minutes behind schedule after leaving Prince Pupert 90 miles to the west @ 8 AM PST. 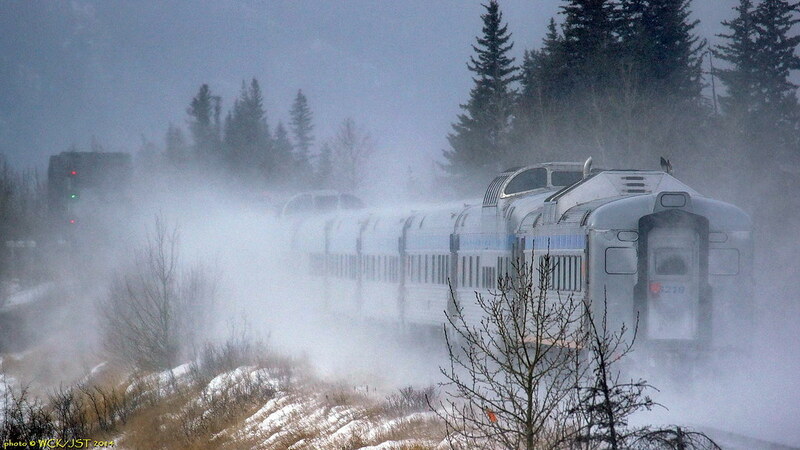 On the previous day the west bound train was 2.5 hours late reaching Terrace from Prince George. 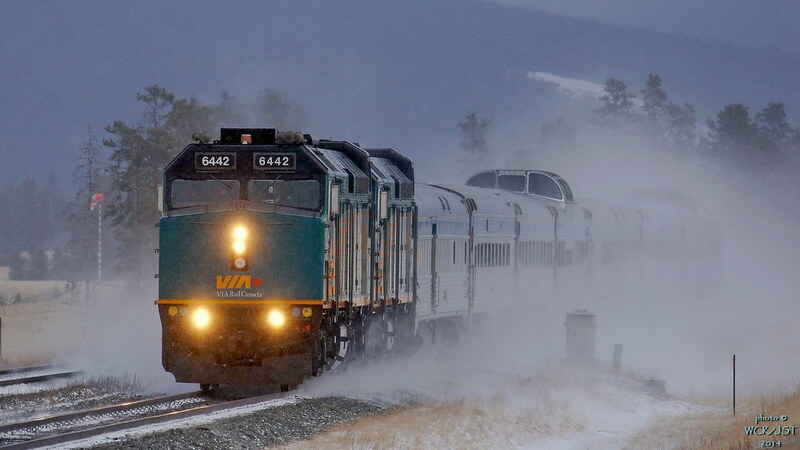 They sat in a siding near Vanderhoof for two hours. CN is to blame for this, not Via. This is happening frequently & CN should be forced to explain why! 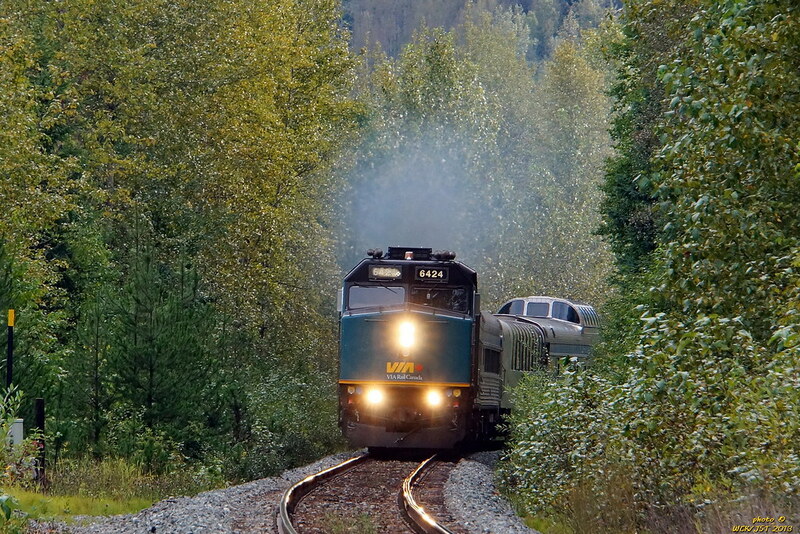 Note that in this photo the Skeena is back in its off-season configuration - one locomotive, one coach & one dome. In the summer there are two extra cars. Morant's Curve is a superb spot for railway photographers. 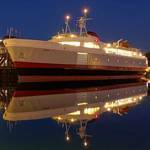 It is named for the great CP staff photographer Nicholas Morant, who also took many fine photos of CP's ships including our BC Coast Princesses. 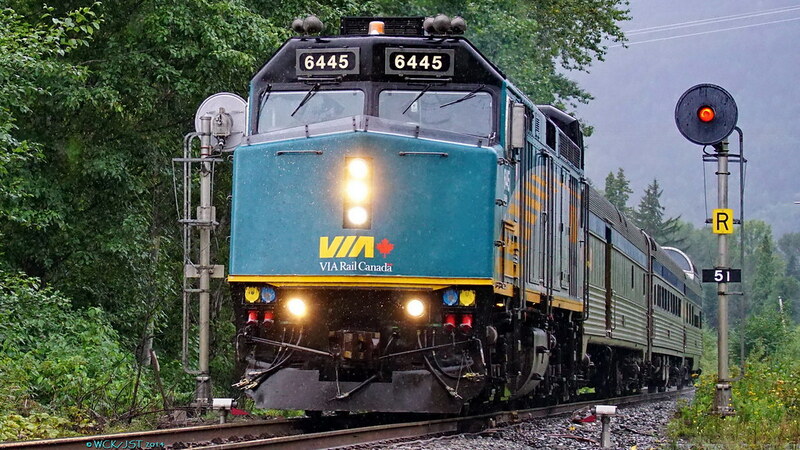 I recently bought a pocket sized photo of VIA locomotive #6403, pulling The Canadian. My bank was selling them, and it only cost me $10. Has anyone else bought these art-cards recently? I think that some retailers are also selling these art-cards, but only when you buy something else and overpay. The retail art-card world can be strange. I haven't gotten the VIA locomotive card, it is too expensive. I did manage to snag a space themed one. It was much more on budget. You can purchase a metallic emblem of a loon bird. Most banks will sell this artwork for only $1. USA people currently get a special sale price on the loon art. 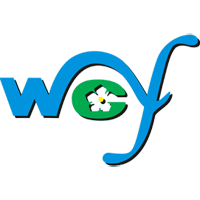 WCK note: copied over from the Vancouver Island Railways thread. 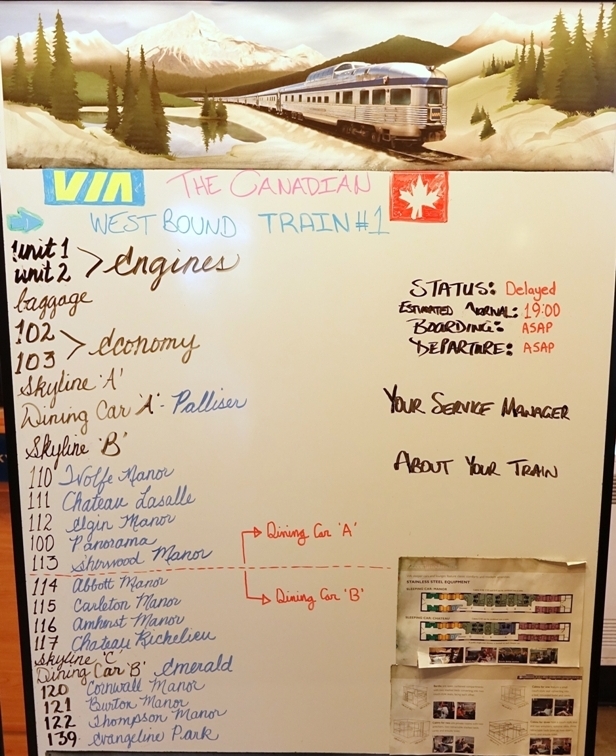 My understanding is that it is Via employees who man most of their trains, and not employees of whichever railway their trains happen to be operating over.&nbsp; In the past they were CN or CP employees but not anymore.&nbsp; There are exceptions such as was the case with the Vancouver Island dayliner where the crew was from SVI. 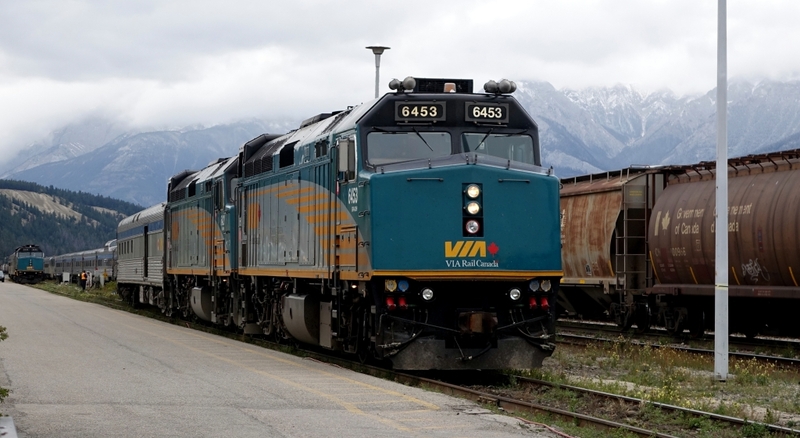 Having said this, the Via employees may in fact be on long term loan to Via from CN (or CP).&nbsp; I had heard that if Via shut down a route the employees would be able to 'go back' to CN/CP. Jim has it right - passenger rail employees are generally not provided by the railway on which they operate. 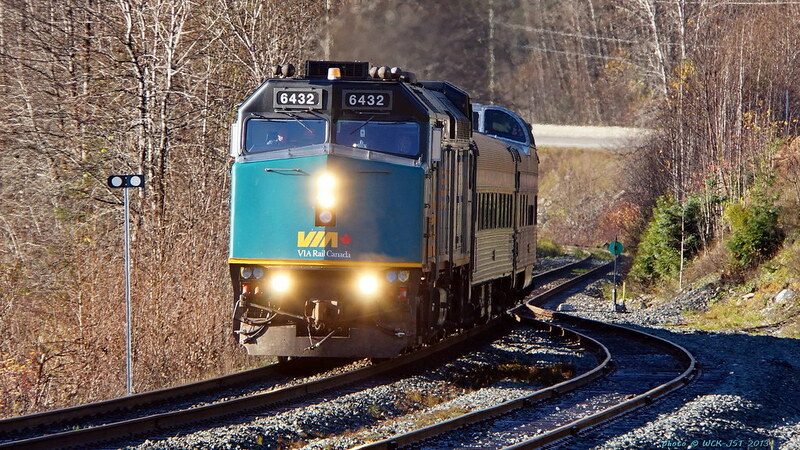 Through an odd structure of transportation bureaucracy (between TransLink, it's subsidiaries, VIA Rail, and CP Rail), ultimately the WCE is operated by crews hired and employed by VIA Rail Canada, as well as maintained by crews based at their Vancouver service yard. GO Transit in Toronto is similarly structured. The GO Trains are actually operated by Bombardier crew. GO Transit is complex in that it operates on both CN and CP tracks (60%) and GO Transit owned (about 40%). 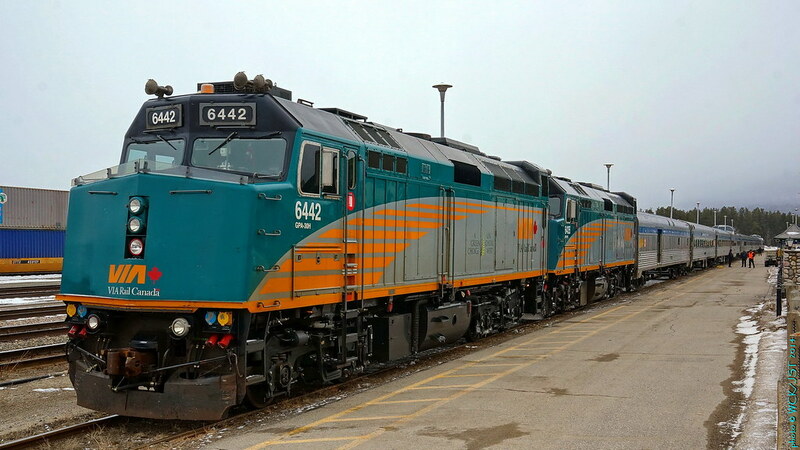 As lines become surplus GO Transit has purchased track, and as expansion has been required, new track has been laid in the rail corridors so the above might have changed in GO Transit owned favour. I believe that GO owns the new track laid in the corridor. As well Metrolinx the newer Regional Transit body, has invested huge sums to increase capacity by separating grades. Where my brother lives in Toronto is an area that was huge for the railroads, as three lines crossed there and therefore even called the Junction and the symbol for the area is a steam train locomotive. Two of the main lines will no longer cross but are grade separated so one passes under the other. 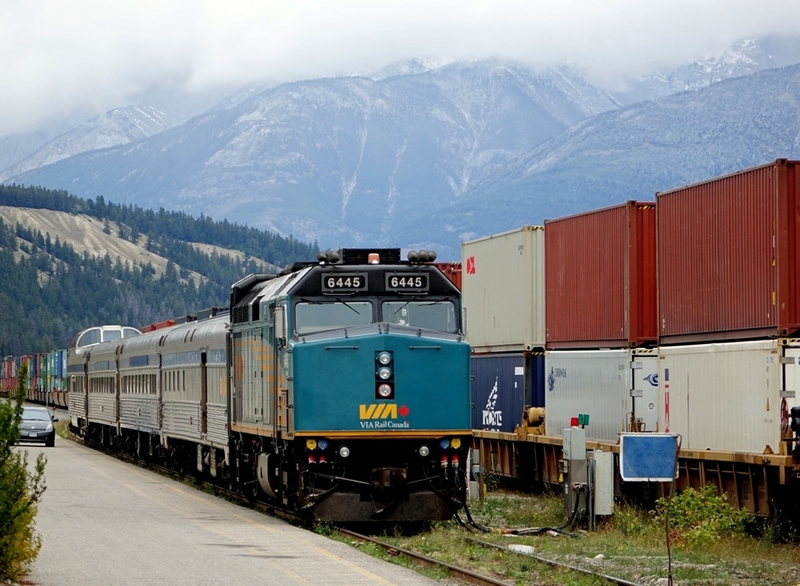 This will allow freight trips to not be impacted as much by one of the growing GO Lines and new airport express service. Two of the GO Lines passing there have trains going by every 10 minutes which pretty much shuts down freight during the morning and evening rush. Adding the airport rail express and talk of making the GO lines all day two way and not just rush hour service would have been a nightmare. The largest volume and oldest line the Lakeshore Line is the first to be electrified. I don't know how that complexity will impact existing rail ownership. 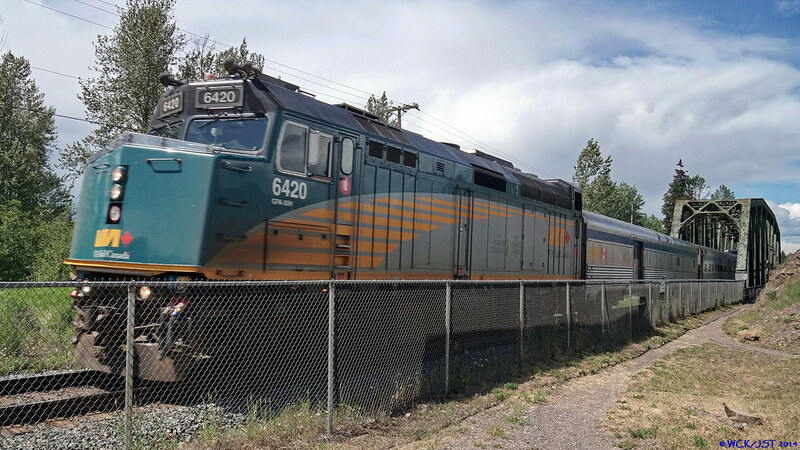 There is huge pressure to speed up the electrification of the Airport Express line and the one GO Train line that runs through the middle of residential areas. I think this might become an election issue due to the associated pollution from the diesel engines even though they are the cleanest ones at the moment. GO makes a point of using contractors for everything from cleaning to repair and maintenance etc. 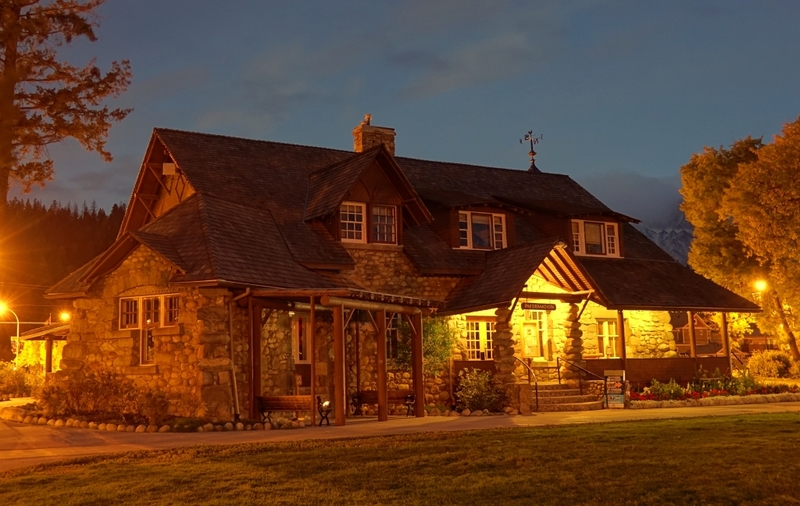 It is regularly tendered to keep prices as low as possible. So actual GO employees are much less than you would expect. And to add to the complexity, it may be that while GO owns the track they would likely contract with CN or CP or someone else to actually maintain it . I don't know as much about Montreal operations but they have a rail transit service that runs I believe fives lines on track owned by railways. I think it has been similar to GO with unused lines bought but the vast majority are existing railways. Here in Seattle, Sound Transit's Sounder commuter train system runs almost exclusively on BNSF-owned and maintained tracks (except for the short stretch between Tacoma and Lakewood, which is owned by Sound Transit). BNSF crews operate the trains, which are owned by Sound Transit and maintained by Amtrak at the joint yard they have just south of the stadiums. The best mix of companies was perhaps formed when the I-5 bridge over the Skagit River collapsed and a train ran daily to Bellingham and back. The train was operated by Amtrak using Sound Transit equipment on BNSF tracks, the whole funded by the DOT. Teamwork. So I am behind the times. GO Transit is now over 68% owned lines, with the number being purchased increasing yearly. The one line which starts downtown at Union Station and ends in Milton (one of Canada's fastest growing cities) is still operated by CP because they own the majority of the trackage on that route. A third set of rails is being added and I don't know if when that is complete Bombardier will get the total contract for all the lines. 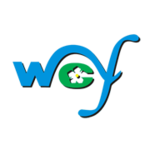 Just after I posted the Provincial Transit Minister, Glen Murray(former Mayor of Winnipeg) and Premier Wynn, announced that they want GO Transit to have two way service every 15 minutes on all its routes and that it be all electrified within 10 years. 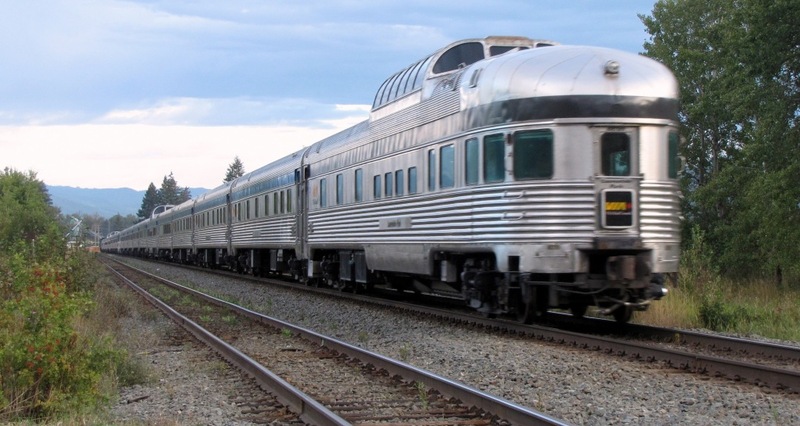 Electric trains accelerate faster, are quieter, and can be run closer together. Part of a 29 Billion dollar transit funding promise that includes a relief subway line from downtown, LRT for neighbouring cities and other likely goodies that anticipate an election within a year. 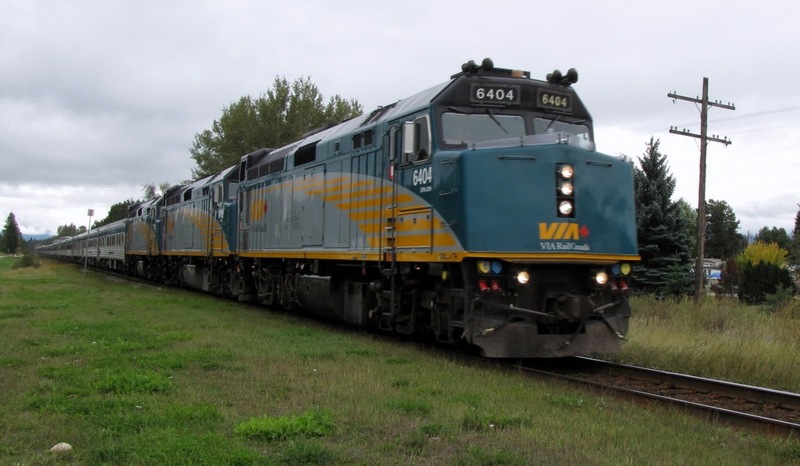 The downtown to Oshawa line rail transit will likely extend to Peterborough, full service from Hamilton to Toronto, and other extensions are planned with full daily service to Niagara possible rather than summer service now. VIA does further than Kitchener Waterloo (ie. London) and to Peterborough now. This regional rail service will be designed to match London, Paris and New York as far as aggressive moving of cars off the roads with a change from rush hour commuters to full day transit. It is also designed to try to move some commuters out of subway until the much more complex relief line can be built. 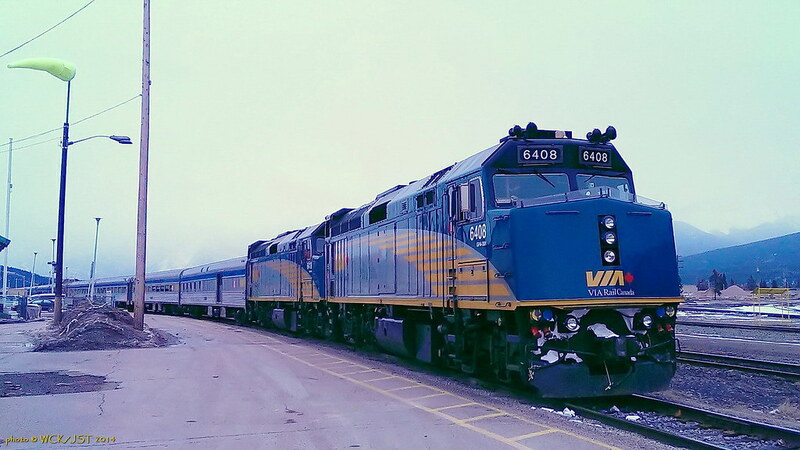 Here are a few Via Rail photos I have taken so far this year. 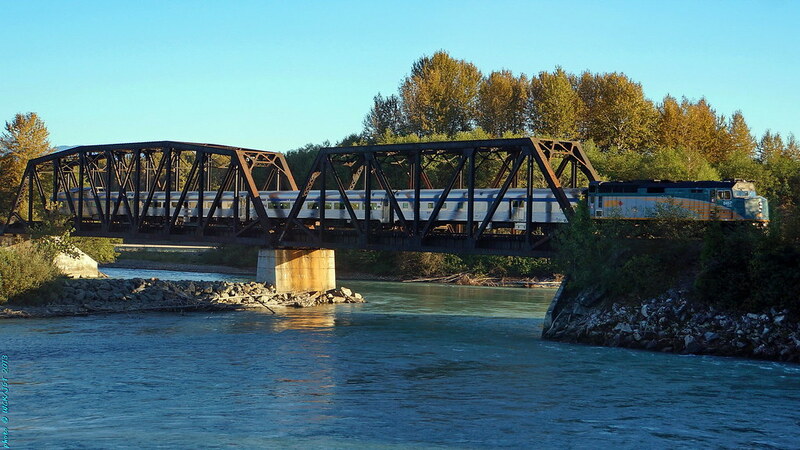 The Canadian - Via's train #2 - east bound through signals at the end of double track leading into the Snaring River bridge, east of Jasper, Alberta - 26 March 2014. 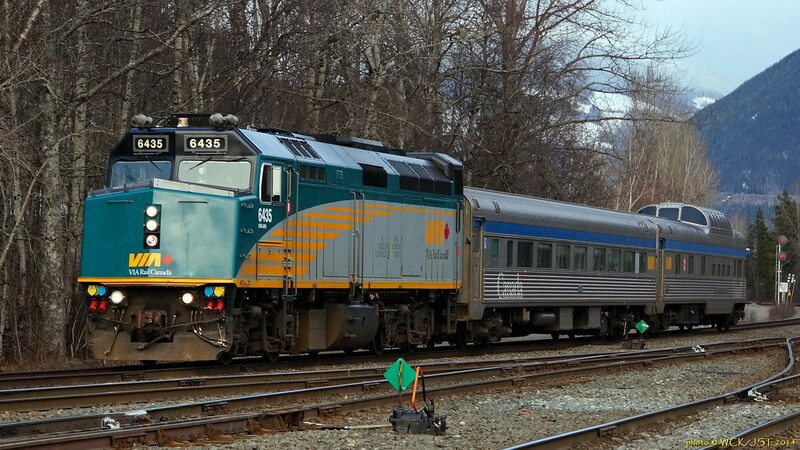 Note the RDC car attached to the end of the train. A smaller consist than I was expecting. I am using a 2-camera approach for these train shots. 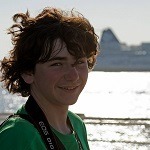 Video is filmed on my Sony, while I shoot rapid fire stills on my older Canon. These are Canon shots, and I'm still learning how to do good stills of moving trains. 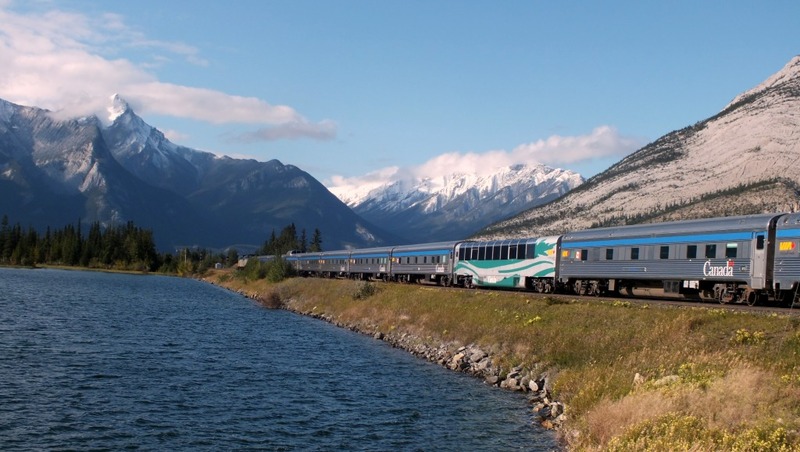 - I need to be able to do this well, by the time I see the Rocky Mountaineer at Morant's Curve. There are three locomotives & four domes, and what looks like twenty cars behind the power. 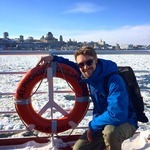 That is, I think, the standard summer consist for The Canadian. 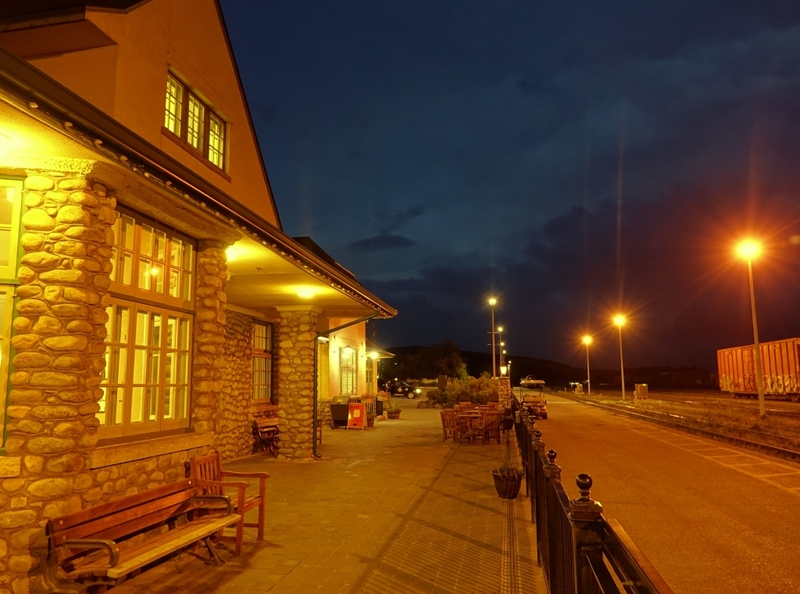 The train runs three times weekly during the summer; only twice weekly in the 'off-season'. 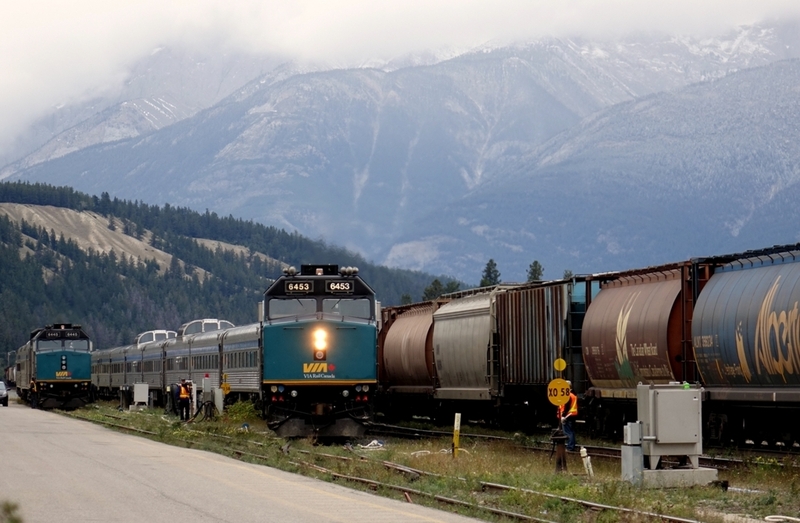 VIA rail at Jasper, AB - September 9, 2014. Westbound Canadian arriving, 5 hours late. Jasper station is a lovely building, exterior and interior. 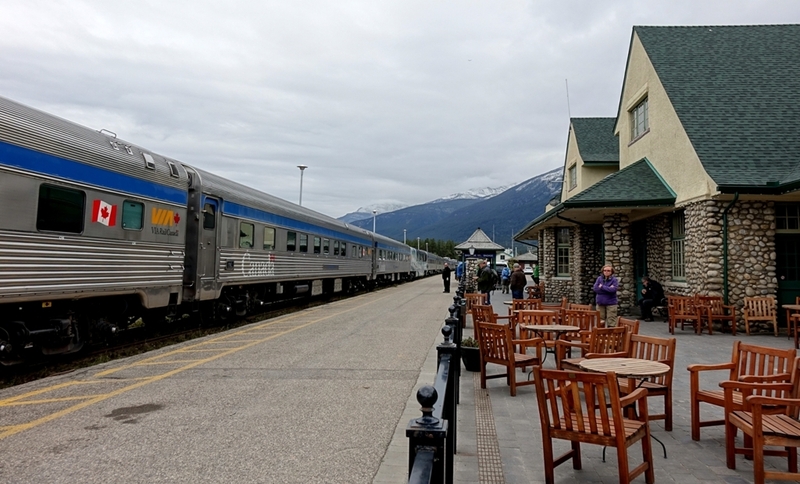 The railway station in Jasper serves both VIA and Rocky Mountaineer customers. It also serves as an interesting photo opportunity for early morning hobby photographers. Lots of buildings in Jasper have stone work on the exteriors. This is because of the abundance of stones from the nearby river areas, likely from the glacier history (long time ago) in the area. 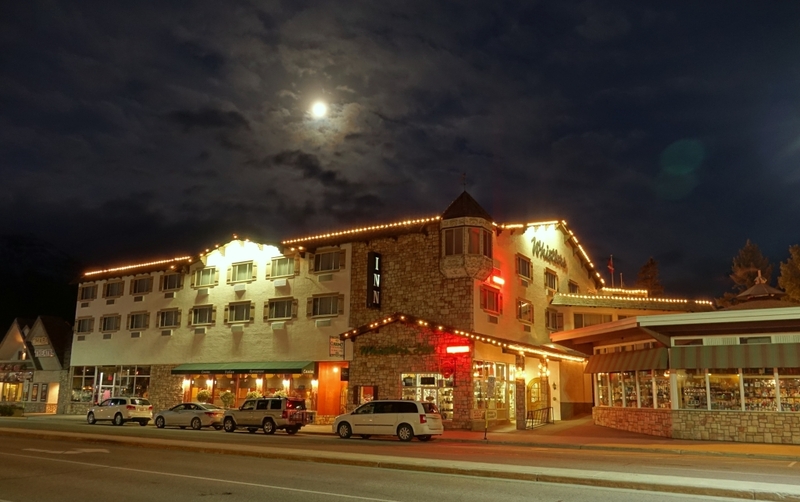 Across the street is the Whistlers Hotel. Also across the street is the old Jasper National Park admin building, now the travel info centre and "Friends of Jasper" store. A lovely 100-year-old building that is my favourite in this town. That is an interesting building with an interesting history. 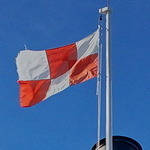 It is a National Historic Site. For more on this see this info from Parks Canada. 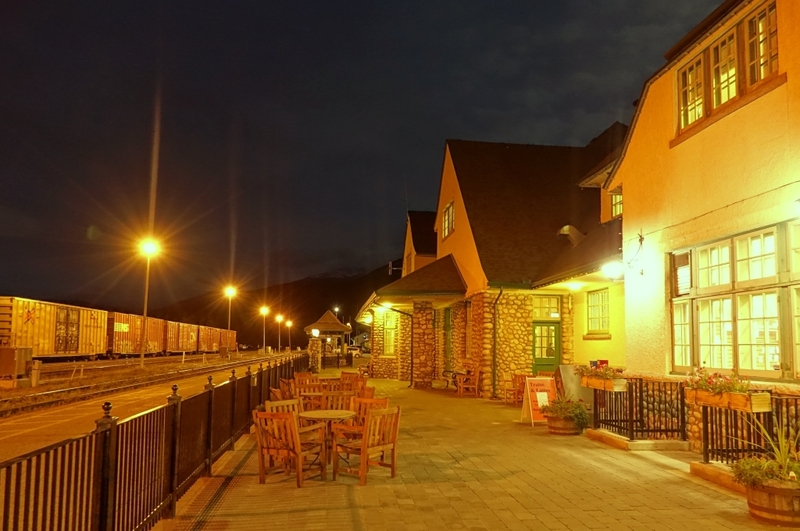 The architectural style initiated in that building influenced the construction of many other buildings in the Jasper townsite, including the current railway station. The original GTP station was lost to a fire in 1924. 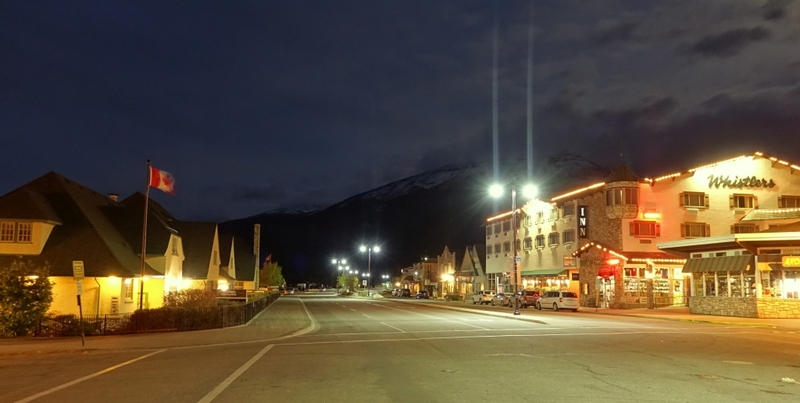 The town of Jasper was originally named Fitzhugh. 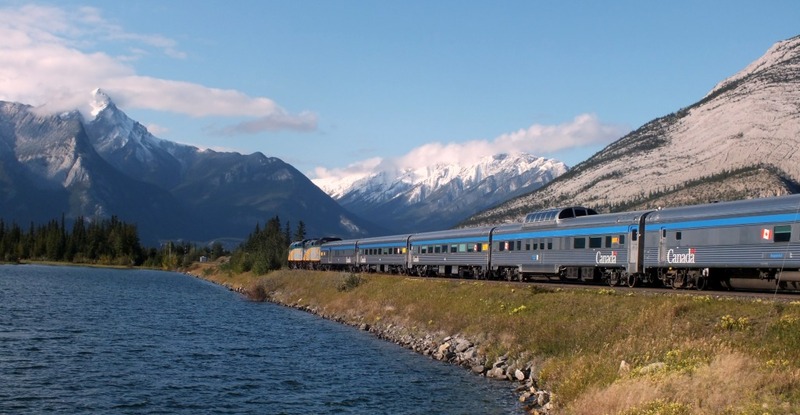 It was named for a Grand Trunk Railway vice-president, Earl Hopkins Fitzhugh. After the GTR President Sir Charles Melville Hays perished in the sinking of the Titanic, Mr. Fitzhugh had a serious falling out with other GTR executives and he resigned. This then led to legal action against the company. 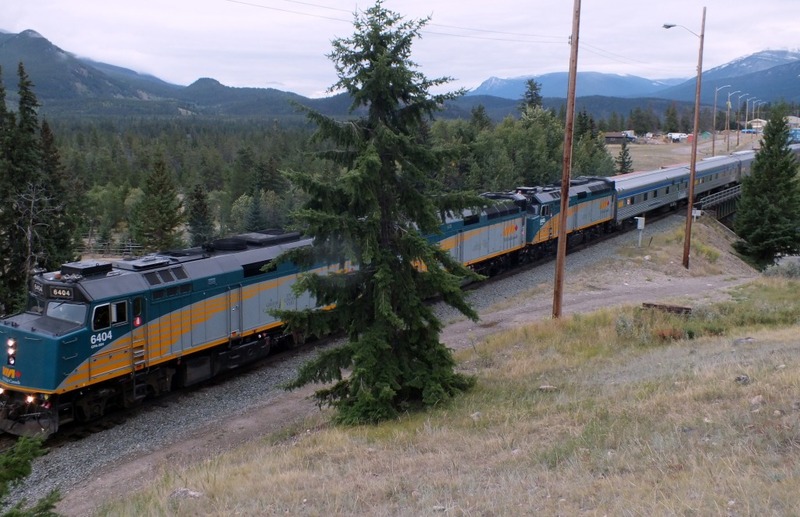 The railway & the people of the town both petitioned the Dominion Government to have the town's name changed to be the same as the name of Jasper Forest Park, as the park was called at that time. The name Fitzhugh lives on in a few ways in the town, most notably the local newspaper. 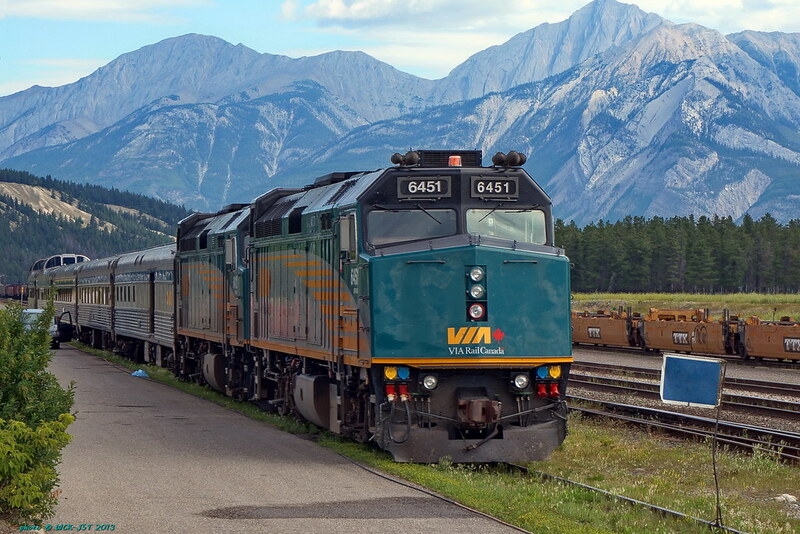 VIA Canadian eastbound in Jasper National Park. Near Snaring River, on September 10, 2014. The odd-ball car is the panorama car. VIA only has 3 of them.